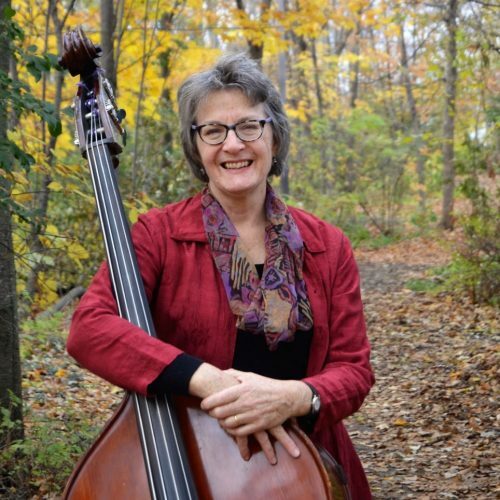 Ann Downey can usually be heard in Ottawa singing harmony and playing upright bass in a full spectrum of musical styles. She sits in comfortably on music from Appalachian old-time to jazz – and most of what falls in between. Originally from the southwestern U.S., she grew up absorbing her parents big band and mariachi records, singing in church choirs and learning to sing harmony in the car on their many moves. Since then Ann has lived and performed in Europe and the U.S. before settling down in Ottawa where she has sung, played, recorded and toured with local favourites including Finest Kind, Sneezy Waters, The Old Sod Band, Pat Moore and the Vinyl Frontier, and the Toasted Westerns. These days Ann can also be found playing bass in Just Friends, a brass quintet style jazz combo, The Shirt-Tearing Boys – western swing and other 30’s and 40’s music, Kanata Symphony Orchestra, jamming in people’s kitchens, teaching clawhammer banjo at Alcorn Music Studios, and supplying bass, banjo and vocals on studio projects with other fine Ottawa area musicians.